A bit of salce (pronounced salje) in the fridge makes simple meals easy this summer. Cut 2 -4 potatoes into even-sized chips, any style. Fry them in hot oil (I use coconut in a shallow cast iron pan). Maybe two batches. When the potatoes are golden-crispy, remove & blot with a paper towel to soak up excess oil. 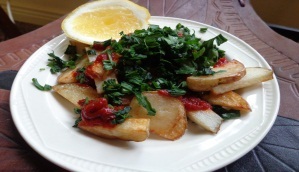 Mix 2 Tablespoons of salce with juice of a lemon, so that it’s thin enough to dollop over the fried potatoes like ketchup. Heap the whole thing with chopped fresh parsley. Think of parsley as a vegetable. Eat it with a fork or pick it up with ripped pieces of French bread. 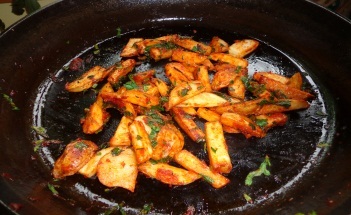 Drain most of the excess oil from the pan and add 2 or more Tablespoons salce (I don’t know! How many potatoes did you cook?) Heat, add the juice of a lemon, stir. 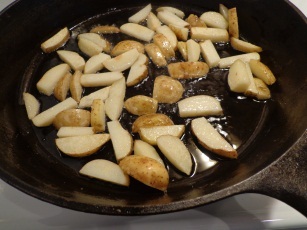 Add the fried potatoes, stir to cover in salce mixture and leave to fry a few moments at a time, turning when the salce blackens. Add ripped fresh mint or sprinkle lightly with dried mint. 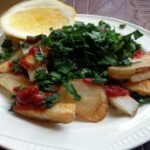 Serve with about a cup of chopped fresh parsley on top. Slice an eggplant, sprinkle with seasalt, set aside. Peel 6 – 8 cloves of garlic. Heat olive oil in a fry pan. Dap eggplant with a paper towel to dry as the salt draws out moisture. 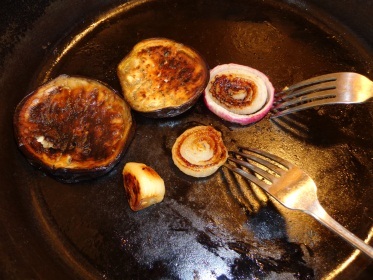 As the oil comes up to medium heat, add eggplant slices and garlic cloves. Add olive oil liberally as the slices fry to sticky brown and you move them all in and out, turning them and the cloves until browned and soft. 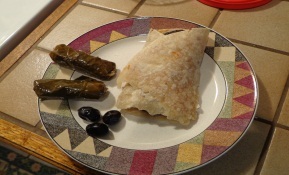 Spread tortillas or flat bread with salce. 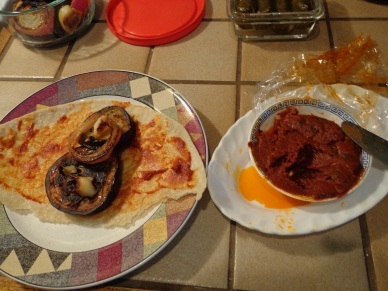 Mash or cut up the garlic cloves and add to sandwich with eggplant slices. Roll. Lotsa options: add a few potato fries from above, maybe black olives, blackened green/red pepper, fried onion, parsley, any leftover chicken in the fridge? Put them in a pot with 2-3 Tablespoons of salce, 3 or 4 cloves of garlic (whole or sliced) and just cover with water. Boil until most of the liquid evaporates. 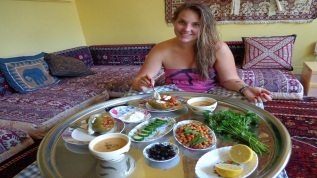 Optional- add ripped fresh mint or crushed dried mint during cooking or as a garnish. 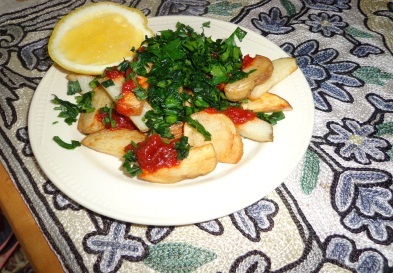 This entry was posted in Int'l Recipes by Laurie Fraser. Bookmark the permalink. 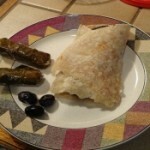 I just made a new batch of salce so I was happy to see new recipes. I’ve been eating so much of the cold tofu because its just so easy. and the stuffed pepper too! Thanks Anne! Lentil soup is coming soon- I’m in a vegetarian mood this summer.